I have already done this as a program and it was very successfull. I also made these as presents for my co-workers, using old novel covers. They best way to get images that are small enough is to print them out using Windows Picture and Fax Viewer using the Contact Sheet print size. I always saved my mint tins, hoping I could find what they were good for. I finally found it! The collage paper will stick to the tins wonderfully if you apply the glue to the paper and stick it to tin. I use Mod Podge as a glue and sealer. These are simple and look like you bought them at a specialty stationary store. 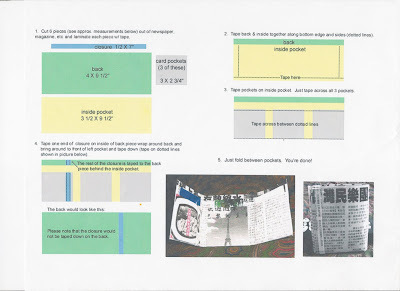 To make the envelope, just carefully unassemble the envelope and use it as a template to cut out and fold the comic pages. For the images on the card, just white out the speech bubble and write in your own message. Using book glue, paint the outside edges of the book. Use a Xacto knife or box cutter to cut out the middle of the book. Coat the inside of the 'box' with the book glue. Many old paperbacks have great funky covers. Go through your donated items and see what you can find! Tear off the cover. Cover it with clear packing tape or contact paper. fold it into thirds. Sew it together to create a pocket with a flap. (You can also just use tape, but it's not a lot of sewing and makes it look much nicer.) use self stick velcro create a closure for your wallet! Here's a Packing Tape Wallet! This is a great craft for teens that also gives your YA area a little personality! It's super easy! I just sprayed our existing bookends with a spraypaint primer. We used acrylic paint and our imaginations! They are collages made on playing cards with words and phrases designed to inspire and encourage. The purpose is to make them and leave them in public places to make someone smile, or think, or feel warm and fuzzy. Teens always love my collage programs. It's so creative and easy and open ended. You can buy the metal words and phrases in a craft store along with great paper. It's really easy to collect great collage supplies and it really doesn't cost anything! Save your weeded magazines and old foreign language newspapers. The very first program I did when I began working in Wake County was a Tshirt Surgery program. There was a HUGE turnout and they keep asking for another. There are great books out there to give you directions and tips, including Generation T.
Our TAB group also make Tshirts using stencils. If you have a graphic image you would like to use, print it out, tape a piece of overhead projector acetate sheets to the image and use an xacto knife to cut out the stencil. We love our shirts! seem like the answer, but it'll probably just get you killed. For the first time in a long time I found myself missing working with small children. Yesterday I came across a new picture book by one of my favorite authors, Bob Graham. If you are not familiar with him I suggest you check out some of his books. All of his books are about modern young families that combine compassion and appreciation of the small things in life in an urban setting. In Jethro Byrd, Fairy Child a child finds a small family of fairies living in the empty lot next to his apartment building. I am one of those people who can see broken glass as fairie dust sparkling on the asphalt and I love that this book teaches children there is magic everywhere even amongst cement and weeds. In Let's Get A Pup Said Kate the family cat dies and the family decides to go and get a dog to fill the cold spot on Kate's bed. The family gets the perfect Pup but how can they leave Rosie, the older sweet dog at the pound? The family is unconventional and realistic. The parents have tattoos and piercings and the house is a bit of a mess. In Oscar's Half Birthday a biracial family set out from the city on a long trek to a grassy spot to celebrate Max's Half Birthday. The story is full of love and is sure to melt your heart. I was quite pleased to come across How To Heal A Broken Wing as it is a classic example of how wonderful Bob Graham's books are. This is a story about taking some time out of your busy urban life to focus on nature and how hope and compassion can heal. Being a city parent and having a child who has a very big heart when it comes to animals this book touched me deeply. The story begins with a busy urban scene, people in greys hustling on the street talking on cell phones and looking straight ahead. One of the great things about Graham's books are his representation of all people. In the crowd you can find elderly people, woman in burkas and people of all colors. No one noticed the bird that flew into a building and fell to the ground... except for Max. Max is in bright colors standing out from the rest of the dingy city scene. He and his mother take the bird home where Dad helps to make a safe place for the bird to heal. Another great thing about Graham's books are the details he puts in to add depth for the parents reading it to their children. The book doesn't have a lot of words and in the graphic novel like pictures we see Dad lining a box with a newspaper depicting pictures of war. This is subtle but represents how even in times of great difficulty hope can heal. They help the bird to heal with time (we see the calendar squares marked off and the moon change phases) and they return to the street to set him free. Bob Graham's books are a sweet reminder about the simple things and I suggest reading them with someone, old or young, that you love. These are the coolest things ever! Honestly, I could not write up better instructions than this person, Paper Tart's Shrinky Dinks, so just visit their site. Express Yourself: Steal These Ideas! What makes these really cool is that you can use anything under clear packing tape! Popular items are foreign newspapers, maps, graphic novels, sheet music. All of the instructions are right here in the pdf file. Just right click the file to save it. I call myself a creatrix. I believe everything I do is art.